A moment of huge controversy in the 100th minute saw Luton Town caretaker manager Andy Awford enjoy victory in his first game in charge at Exeter City this afternoon. With the nine minutes of injury time virtually up, and the scores level at 2-2, second half substitute Jack Marriott escaped on the right flank and delivered a cross that appeared to be deflected into keeper Bobby Olejnik’s gloves. However, the ball and keeper were bundled into the net by Paul Benson, who after a nervous look at the officials, wheeled away in celebration. Understandably, the home fans and players were up in arms as the goal was allowed to stand, especially as City had fought back from 2-0 down to level at 2-2 and over the 90 minutes, had been by and large the better side. Huge credit must be paid to Luton’s determination and back-line though, in particular returning captain Scott Cuthbert, who was excellent throughout, making a host of crucial interventions, as without them, Hatters would undoubtedly have made it five straight defeats. Awford, who had promised a tweak to the side after taking over from John Still on Thursday, delivered exactly that. Jake Howells returned from the wilderness to start his first game after not playing at all this season, while Cuthbert and Cameron McGeehan were back as Scott Griffiths dropped to the bench, while Luke Wilkinson (hamstring) and Jonathan Smith (knee) missed out. The visitors had a fine chance early on as Danny Green won possession and raced away, only to brought down on the edge of the box. He sent the resulting free kick disappointingly into the wall, with Alex Lawless volleying the rebound tamely over. Exeter should have had the lead on 12 minutes though when a poor clearing header from Cuthbert saw the ball fed out to Joel Grant, who delivered for Alex Nicholls on the penalty spot, as his forced Tyler to palm away magnificently. Grant was then left in acres of space to have a shot deflected wide, while the hosts impressed as they had done against Luton on both occasions last season, building from the back and always trying to prise an opening through some intelligent passing. The sparse visiting supporters were reduced to sarcastic ole’s as Hatters eventually enjoyed a spell of possession, working their up the pitch as Howells cross was blocked. However, City clearly looked the more likely, Tyler handling well from Grant and then clawing aside the same player’s low daisycutter. Somehow, the game completely changed on its head after half an hour as a good passing move by Hatters, saw Sean Long have his heels clipped in the area by Craig Woodman for a penalty. There was some needless argy bargy before the kick was taken as McGeehan claimed the ball from Green who had scored from the spot against Northampton last week. However, the midfielder showed no signs of nerves, confidently beating Bobby Olejnik into the bottom corner. The goal saw confidence immediately lifted though and in the flash of an eye, Luton had doubled their lead as Long dinked over a cross that Green volleyed through the legs of Olejnik for a second Luton could scarcely believe. Hatters soon got back into the their pattern of having to soak up the pressure from either flank, as the defence stood firm, just, with Cuthbert, Okuongheahe and Long all making last-ditch clearances, while Tyler palmed Woodman’s blast wide. Grant then wasted a glorious chance minutes before half time, as the ball dropped to him 16 yards out, but he could only balloon over. In the second period, Hatters started well, as they began to look more confident when in possession, Benson looping a header into Olejnik’s gloves. Jamie Reid shot over for the hosts, but Luton then came close to a third as Woodman’s back pass was seized upon by Mackail-Smith, who teed up McGeehan for an effort that was deflected behind. Green’s resulting corner was powered over by an unmarked Benson as the hosts mounted some pressure, forcing three corners, with Luton’s defence repelling them all successfully. Town’s back-line was dealt a blow when Howells took a knock while clearing and had to be replaced by Griffiths, as from then on, the hosts were always in the ascendancy. Exeter had one back on 71 minutes as Grant drove forward from midfield and was eventually brought down 20 yards from goal. Tom Nichols stepped up and almost Cristiano Ronaldo-style side-footed it up and over the wall, beating Tyler. Luton were fortunate not to concede a penalty almost straight from the restart as a cross appeared to strike Griffiths’ hand and fly behind, but nothing was given. Jordan Tillson opted to shoot at Tyler from range, but the incessant pressure paid off with seven minutes to go as an excellent corner was swung in and Nicholls dived in bravely to head beyond Tyler, clashing heads with Cuthbert in the process. With Luton having frittered away yet another 2-0 lead, there looked to be only one winner as Nicholls’ right footed volley was parried up by Tyler and blocked behind for a corner. Hatters had made a bold substitution though with Jack Marriott on for Green, as with nine minutes of stoppage time, due to a linesman injury, he had a marvellous chance. After fellow replacement Josh McQuoid burst away from his own half, Marriott took his pass and was denied by a superb save from the onrushing Olejnik. 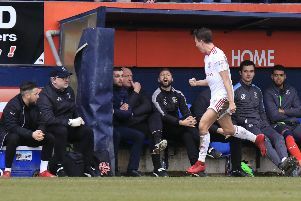 However, Marriott had redemption of sorts moments later, setting up Benson’s last-gasp winner, as Hatters ended a run of four successive defeats, climbing to 13th in the table. Grecians: Bobby Olejnik, Craig Woodman, Matt Oakley (Ollie Watkins 59), Lee Holmes, Aaron Davies, Alex Nicholls, Jordan Moore-Taylor, Jamie Reid (Clinton Morrison 59), Tom Nichols, Jordan Tillson, Joel Grant. Subs not used: James Hamon, Jamie McAllister, Manny Oyeleke, Tom McReady, Kyle Egan. Hatters: Mark Tyler, Sean Long, Jake Howells (Scott Griffiths 65), Magnus Okuonghae, Scott Cuthbert, Alex Lawless, Olly Lee, Danny Green (Jack Marriott 89), Cameron McGeehan, Craig Mackail-Smith (Josh McQuoid 71), Paul Benson. Subs not used: Elliot Justham, James Justin, Luke Guttridge, Frankie Musonda. Booked: Grant 32, McGeehan 90. Hatters MOM: Scott Cuthbert. Captain was superb at the back in clearing his lines.